This is part 2 of a series about המשׁיח or hamashiach – the anointed one. Please read part 1 before continuing here. A priest who serves before Yehovah is called הכהן המשׁיח or hakohen hamashiach, the priest the anointed. There are no priests before Yehovah who are not anointed. We tend to use the word priest very loosely and with little understanding behind what it means. The priests who serve in the tabernacle or temple before Yehovah can only come from the sons of Aaron, the son of Amram, the son of Kohath, the son of Levi. The priests [כהנים, kohenim] as applied to Israel’s son/seed (the plural “he”), are all those who enter into or renew their covenant with Yehovah at Passover each year; they only are the kohen to the world and a light shining in the darkness. But not just any seed/son of Israel is the הכהן המשׁיח, hakohen hamashiach (the priest the anointed) who serve before Yehovah and acts as a priest (kohen) before Israel. The process by which a son of Aaron becomes a הכהן המשׁיח, hakohen hamashiach (the priest the anointed) is complex. Exodus 28 describes the clothing that the high priest and all the other priests must wear when serving in Yehovah’s tabernacle or temple. Exodus 29, Leviticus 8 and Yasher all describe the 7 day public consecration process in which a priest becomes the הכהן המשׁיח, hakohen hamashiach (the priest the anointed); during this time the priest does not leave the tabernacle or temple. Jasher 83:1-4 1 And in the twelfth month, in the twenty-third day of the month, Moses took Aaron and his sons, and he dressed them in their garments, and anointed them and did unto them as Yehovah had commanded him, and Moses brought up all the offerings which Yehovah had on that day commanded him. 3 And Aaron and his sons did all that Yehovah had commanded them through Moses, and they remained for seven days at the door of the tabernacle. As I said this is a public consecration process. As a hamashiach the priest has a great deal of authority; and being anointed in the sight of all Israel’s son/seed is a reminder that they are to follow the priests instructions in regard to many things as they relate to life in Israel. The law concerning leprosy in Leviticus 13 and 14 is a good example of this principle. The priest is the one who determines, while following Yehovah’s instructions, if a man is clean (tahor) or unclean (tamei), and whether a garment or dwelling has a leprous plague or not; and their decision is final! 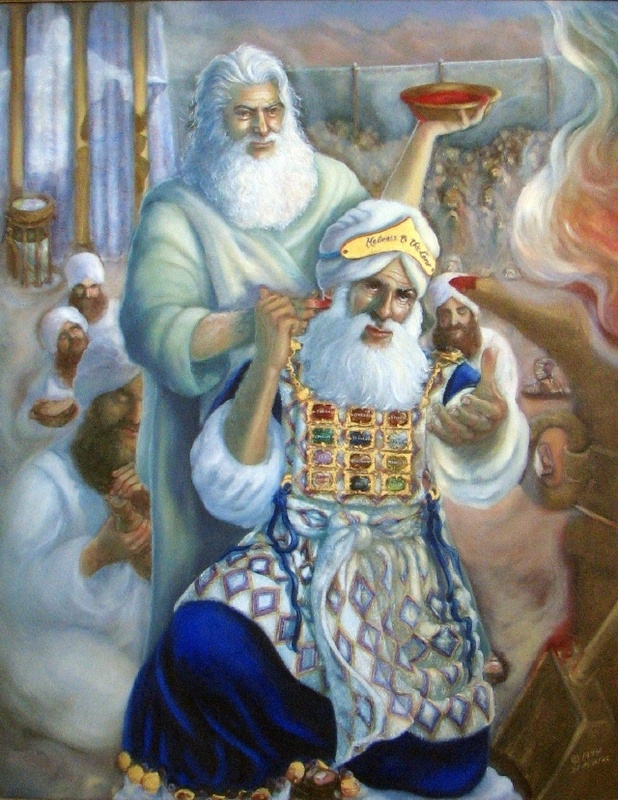 The הכהן המשׁיח, hakohen hamashiach (the priest the anointed) is always anointed before those whom he is to serve. It is the sign to all that he is designated by Yehovah to carry out His instructions. So we see there is a specific place and specific process for a son of Aaron to become the priest the anointed. But it was Moses who was chosen by Yehovah to anoint and consecrate Aaron and His sons. I see Moses as acting on Yehovah’s behalf in doing this. Moses, like the 144,000 (the good shepherds who will be chosen and sealed unto Yehovah in the coming last days) was Yehovah’s shalach, His sent one. The shalach, or sent one, has all the authority of the one who sent him. Eliezer was sent by Abraham to find a bride for Isaac. What he said was as if Abraham had said it, what he gave was as if Abraham had given it, the decisions he made were as if Abraham had made them. Likewise Moses’ anointing of Aaron and His sons were as if Yehovah had done it. Failure to understand the authority of a sent one is part of the reason many, most, confuse Yeshua as Yehovah. Here is a note that leads to still another note on what a shalach is. Is Yeshua God? For today let’s keep in mind that while Yeshua could be a priest, as all of Yehovah’s Ezrach sons are to be to the world, he could not be a הכהן המשׁיח, hakohen hamashiach (the priest the anointed). Next time I will discuss “hamashiach king“, the anointed king.